Published: May 9, 2011 at 03:23 p.m.
You might want to consider a new number, Andy. But you're cool, Dontay. Jimmy Smith wants No. 21 in Baltimore, despite the fact that nobody knows who this guy is. Well, at least not for good reasons. And then there was Andy Dalton proudly displaying his newly minted No. 14 jersey for the Bengals. Yeah, Andy, I understand that No. 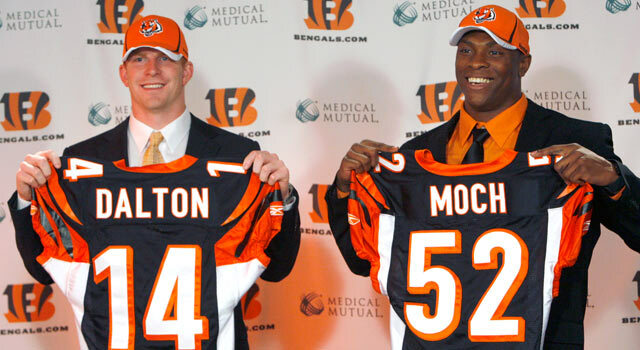 14 was your college number, but the Bengals had a pretty fair No. 14 QB back in the day in Ken Anderson. Now, whether Dalton can live up to the No. 14 or not is debatable. But sometimes there are numbers that should be off limits for incoming rookies. Thankfully, I have ranked the top six for you here. One caveat, though. Nobody in the NFL should wear Pat Tillman's No. 40. An official declaration could never be made because Tillman never sought that type of attention. But there should be an unspoken NFL vow among players to never wear No. 40 again. Nearly made the list: No. 12 Rudy Carpenter, Tampa Bay Buccaneers; No. 88 Emmanuel Sanders, Pittsburgh Steelers; and No. 88 Dez Bryant, Dallas Cowboys. » Al Davis as Darth Sidious? » Who said it: Ryan, or movie coach? Johnson obviously isn't embarrassing the number once worn by the guy with one of the coolest nicknames ever, but the Lions took an awfully big risk by assigning this number to a receiver picked in the Matt Millen era. McMahon was the heart and spleen of those 1980s Bears teams. To give his number to a kicker is kind of a punky thing to do. Why not have Charles Martin slam him into the turf again? You have to appreciate the strain equipment managers were under in the past, considering that receivers were once constrained to numbers in the 80s, but those days are long gone. And since Floyd couldn't make anybody forget Vincent Jackson (wearing John Jefferson's No. 83), he has no business wearing Winslow's old jersey number. The Raiders don't retire numbers, so that is how you end up with guys like Jacoby Ford wearing Ken Stabler's No. 12 jersey or Rock Cartwright wearing Fred Biletnikoff's No. 25. Nothing, however, is as egregious as having another running back wear the No. 32, no matter how upset Al Davis still is. The Cowboys, like the Raiders, don't retire numbers, but you won't see players running around in No. 12, No. 8 or No. 22, either. However, the Cowboys' equipment manager obviously didn't learn his lesson by giving the prized No. 54 to Bobby Carpenter as the number is again in circulation. Bryant wearing No. 88 was bad enough. 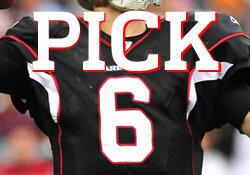 "Pick Six: NFL's toughest players..."